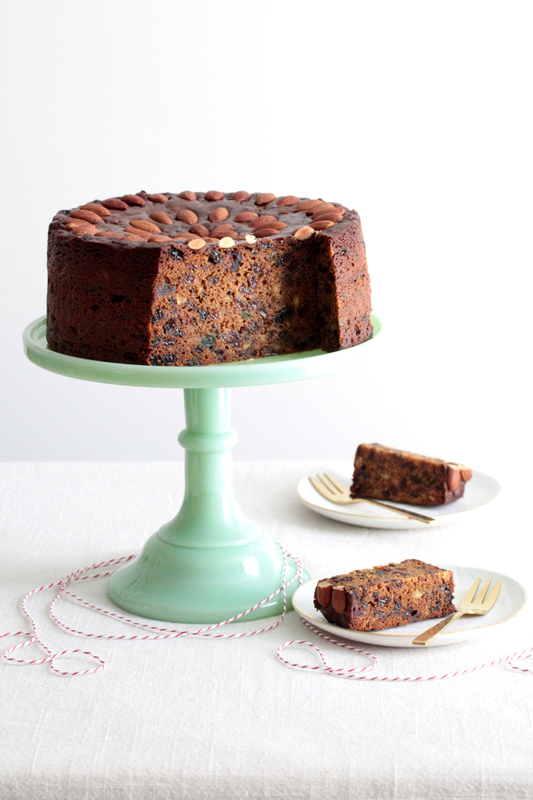 Today I’m sharing my much-requested and very special Christmas cake recipe. This cake’s history dates back to World War II when eggs were hard to come by, so it is interestingly egg-free. It has now been in my family for several generations and I’ve made a few tweaks to the original recipe but luckily everyone seems to approve of my version. 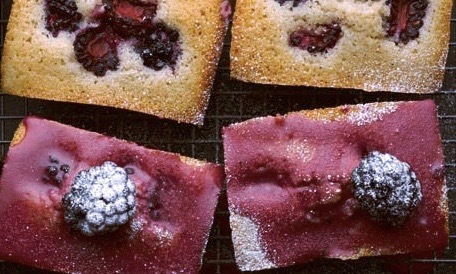 I go back to this cake time and time again because it has such amazing flavour and texture. It cuts well, even when freshly made, so it’s also a good one to make last-minute if you didn’t get around to making a cake in October! I like a lovely tall cake, so I use a 20cm round cake tin. However, if you use a 22-24cm cake tin then your cake will be shallower and may take only 2 ¼ hours to cook. Place butter, hot water, vinegar, cinnamon, mixed spice and dried fruit into a large saucepan and bring to the boil, stirring regularly. Remove from the heat and stir in condensed milk and baking soda (expect the mixture to foam). Set aside to cool to room temperature. Preheat oven to 140°C (not fan-bake). 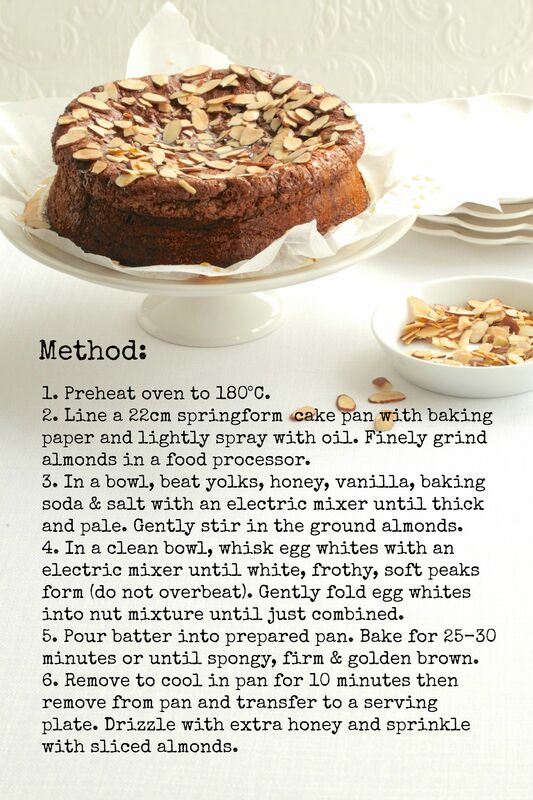 Line the base and sides of a deep-sided 20-cm round cake tin with two layers of non-stick baking paper. Add sherry and vanilla to cooled fruit mixture and stir in sifted flour. Spread mixture into prepared cake tin. 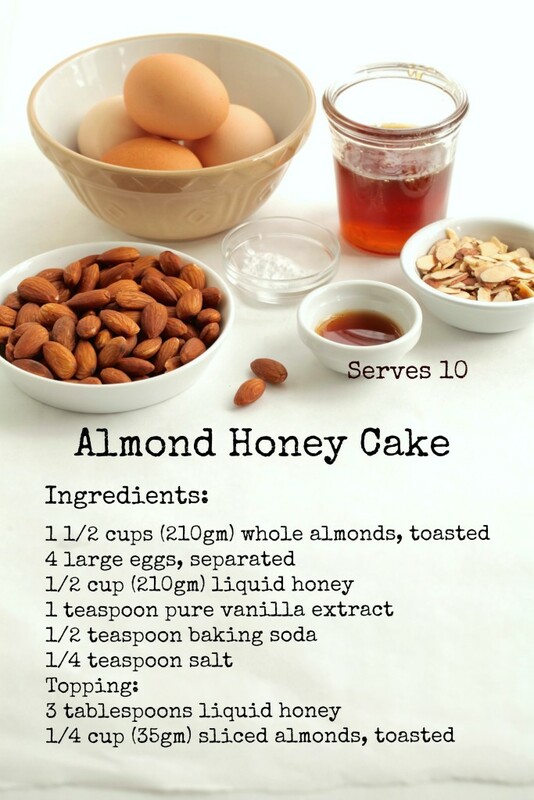 Arrange almonds on top, pressing them in lightly. Bake for 2 hours 30 minutes or until a skewer inserted in the centre comes out clean. Cool completely before removing from cake tin. Note: To store any fruitcake, wrap tightly in a double layer of greaseproof paper and store in a cool place. 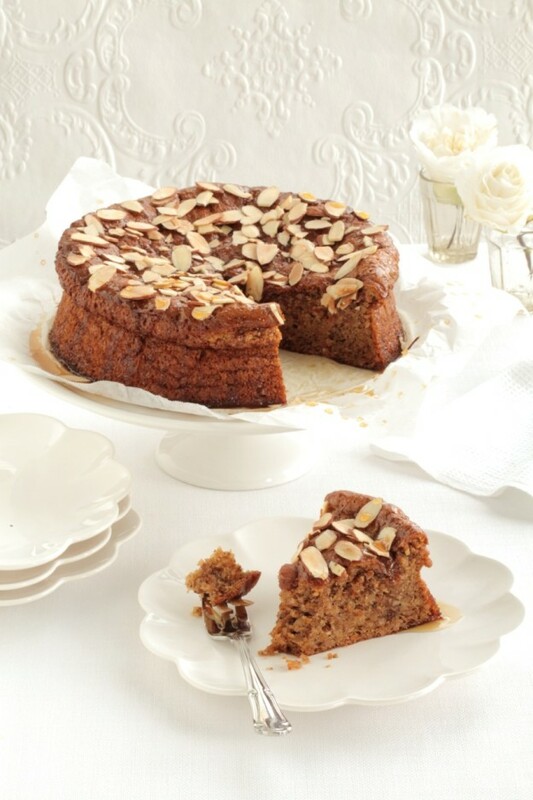 ‘Feed’ the cake with brandy at intervals (say once a week) by poking the cake all over with a skewer, then dousing with brandy so that it soaks in through the holes and permeates the cake with flavour. 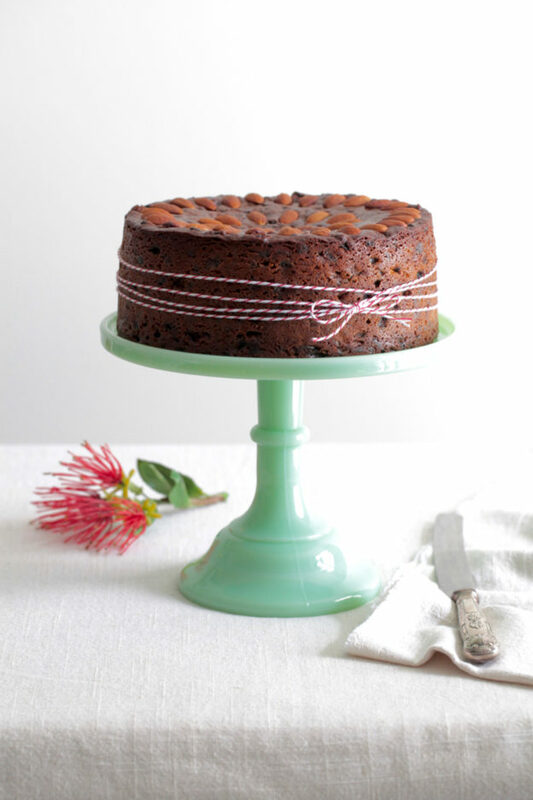 First published in Feast @ Home, by Julie Le Clerc and later published in Julie Le Clerc’s Favourite Cakes (both books published by Penguin Books NZ). This entry was posted in Uncategorized on December 10, 2018 by julie. Happy National Nut Day New Zealand! I’m nuts about nuts! So, to celebrate National Nut Day, which is today folks, here are a couple of recipes that I know you’ll find useful over the coming summer months. 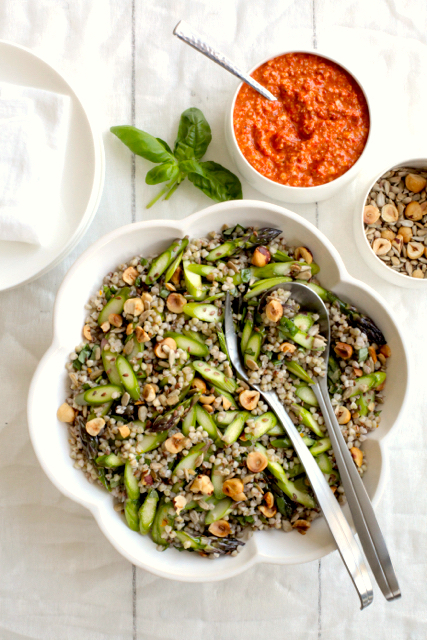 Romesco (a Spanish almond and red pepper sauce) is delicious dolloped over the following salad and many other salad combinations. It also makes a great sauce for barbecue seafood or roast chicken. Place almonds and garlic in the bowl of a food processor and process to chop. Add peppers; process to from a thick puree. With the motor running, slowly drizzle in the oil until amalgamated. Add paprika, salt and pepper to taste. Keeps well for up to 1 week if stored in the fridge. Cook the buckwheat in plenty of boiling water for 8-10 minutes, or until tender to the bite. Drain well and set aside to cool. Finely slice the asparagus on an angle. Combine cooled buckwheat with the remaining ingredients and toss well. Season with salt and pepper, to taste. Serve topped with dollops of Romesco sauce. This entry was posted in Uncategorized on October 17, 2016 by julie. Tomatoes that have been allowed to ripen on the vine while the suns turns their skin a deep crimson are pure pleasure to eat. 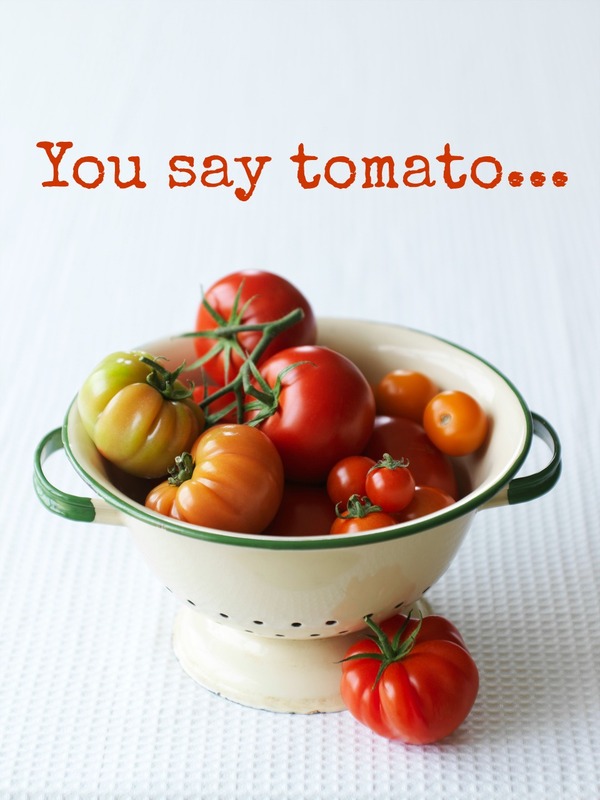 Big, small, round or oval, tomatoes are ripe with the promise of flavour. And these days, tomatoes come in many colours and types, as well – red and yellow, multi-coloured heirloom varieties, cherry, beefsteak, Italian plum or roma tomatoes, green, purple, vine-ripened and pear-shaped – they’re all delicious. Whichever variety you choose, the tomato forms the heart and soul of many recipes for sauces, tarts and pies, bakes, soups and preserves. And nowhere does it shine better than in a salad, tossed with a tasty dressing. So I say, don’t hesitate – dive right into the wide variety of summer-sun-ripened tomatoes while at their peak and most flavourful. Baked tomatoes are an easy summer meal solution. In Mediterranean countries, tomatoes are traditionally stuffed with either meat or rice. 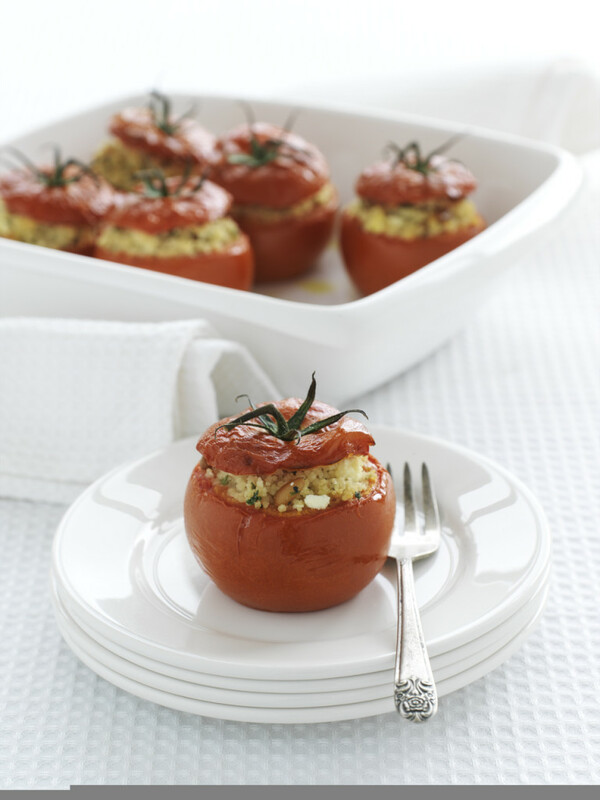 I’ve stuffed these tomatoes with fluffy couscous, salty feta and the fragrance of fresh herbs for a change. 1. Place couscous in a bowl. Place stock in a saucepan and bring to the boil then pour over couscous. Cover bowl with plastic wrap and leave to steam for 10 minutes until softened. 2. Fluff up couscous with a fork and mix in herbs, pine nuts, feta and olive oil and season to taste with salt and pepper. 3. Slice the stem end off each tomato. Using a teaspoon, hollow out the centers, removing and discarding the seeds. Fill each tomato with couscous and replace the ends as a lid. 4. Heat oven to 190°C. Place stuffed tomatoes on a lightly oiled baking tray and bake for 15 to 20 minutes, until heated through and golden brown. Serve hot with perhaps roast chicken, grilled steak or pan-fried fillets of fish. Chef’s secret: Never store tomatoes in the fridge as this impairs their falvour. Place tomatoes in a bowl as you would any fruit, and leave them at room temperature. Tomatoes are a sub-tropical fruit and so respond to warmth and sunlight. Once tomatoes are at their optimum state of ripeness, they should be eaten as soon as possible. This entry was posted in Uncategorized on February 2, 2016 by julie. I want to tell you about a French delicacy that I have adored for a long time now. They may look rather plain but don’t judge a Canelé by its simple exterior. With their darkly caramelised, crunchy outside and soft rum and vanilla-scented custard interior these sweet morsels are addictive. For me, it was love at first bite the very first time I tasted a Canelé. Not to be confused with cannelle (the French word for cinnamon), Canelés de Bordeaux are a truly delicious French pastry/cake creation. As their name implies, Canelés originated in Bordeaux but can now be found in patisseries in Paris and beyond, where they are known as Cannelés Bordelaise (more on this to come, so read on). 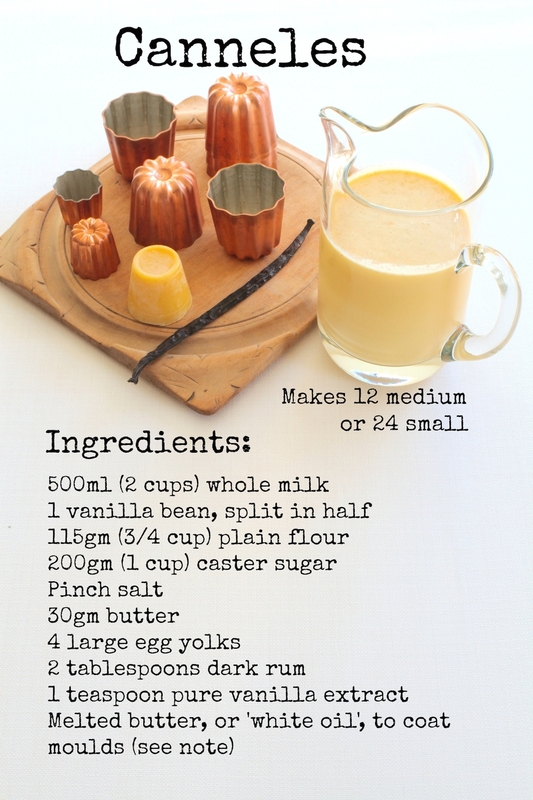 Cannelés have a past steeped in folklore and it is not quite known when the first cannelé was made. All that is known about their origin is they were created by nuns in the Bordeaux region of France sometime before The French Revolution – some accounts date their origin back as far as the 14th century. 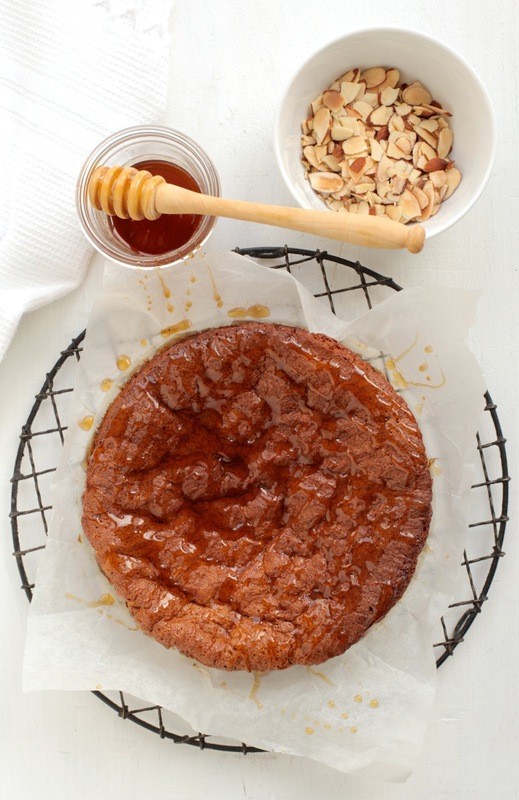 Traditionally, nuns made various baked goodies such as cannelé using egg yolks that were donated by local winemakers who used only the egg whites to clarify their wines. In the 1980s, the French became concerned that the Cannelé would be corrupted by global food trends, so they formed a fraternity of bakers to protect the integrity of the Cannelé. Much like Champagne, which can only be referred to as such if it is from the Champagne region of France, Canelé can only be called Canelé de Bordeaux if they are made in Bordeaux. 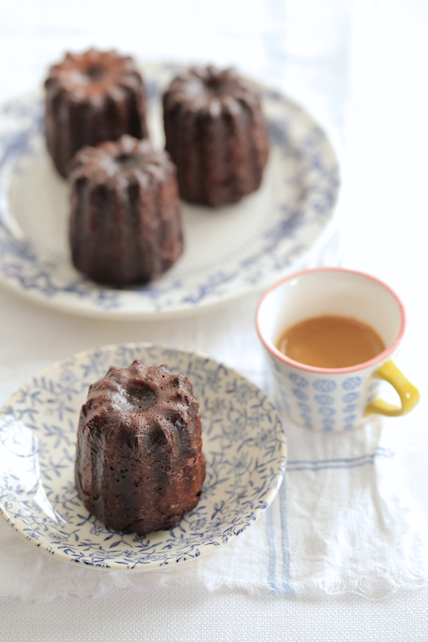 Whereas, Cannelé Bordelaise (spelt with an intentional second ‘n’), is the name given to this sweet treat found in bakeries elsewhere in France and now also around the globe. Just as specialty Macarons shops are springing up all over the world, when I was in Paris earlier this year, I noticed a new phenomenon… specialised Cannelés Bordelaise stores are the new vogue. Cook’s note: ‘White oil’ is made by mixing melted bees wax and then blending in enough neutral oil, such as sunflower or canola oil, to form a smooth white coloured oil. This is traditionally used to brush the cannelé moulds. However, it’s a bit of a palaver to deal with and I find that butter works just as well. 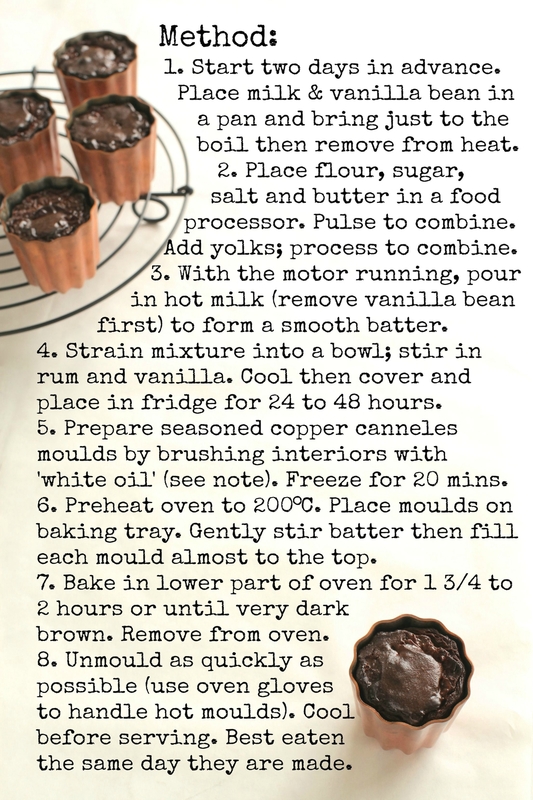 This entry was posted in Uncategorized and tagged cannelés on November 11, 2015 by julie.